Mike Caruso, Orland Park Consolidated High School District 230, USA "DNSBOX is a great value for the price." Andy Fleming, Systems Administrator at Kansas Research and Education Network, USA "CACHEBOX310 is a lot easier to manage than other, more expensive appliances"
ApplianSys’ partner BBCWyse turned to CACHEBOX to help two chains of holiday resorts in Mauritius deliver reliable internet access to guests. CACHEBOX has helped them to overcome the challenge of limited, expensive bandwidth and generate profitable revenue as they can now serve more customers with fewer connections. 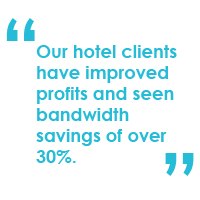 BBCWyse is a leading technology consultancy and systems integrator in Mauritius. BBCWyse serves a number of luxury holiday resorts on the island including large hotel chains such as Sun Resorts and LUX Island Resorts. Mauritius is widely regarded as one of the world’s top luxury tourism destinations. Its hotels cater to guests who expect the very best facilities. Providing internet access for guests can be a highly profitable revenue source for hotels around the world. However, where the cost of connectivity is very high, it can be difficult to provide a service that lives up to the customer’s expectations and at the same time delivers a profit for the hotel. Internet connection costs in Mauritius can be very high with a 1MB dedicated leased line costing around $1700p/m. ADSL is significantly cheaper – $350 per month for a 4MB line – but is not as reliable, particularly at peak traffic times. Most ADSL subscriptions in Mauritius are also subject to fair usage policies that could see hotel guests being cutoff when traffic is heavy or if a limit has been reached before the end of a subscription period. Hotels in the Lux Resorts and Sun Resorts chains each feature up to 480 bedrooms and their bandwidth needs to be able to handle as many as 800 concurrent devices. WiFi networks with up to 80 access points distribute broadband at each hotel and 4IPNET wireless controllers manage guest access and billing services. As dedicated leased lines were found to be too expensive, BBCWyse sought a solution that would help their hotel clients maximise bandwidth available through more affordable ADSL subscriptions. After searching online and reading reviews of web acceleration appliances – including Microsoft’s Threat Management Gateway server – BBCWyse identified CACHEBOX as the most appropriate solution. “We were impressed with ApplianSys’ dedicated support team. They are very professional and have helped us get the most out of CACHEBOX deployments for our clients”, says BBCWyse Technical Manager Leerish Ramsurn. CACHEBOX performs well in WCCP (Web Cache Communication Protocol) mode which made it ideal for integration with the hotels’ existing Fortinet Unified Threat Management (UTM) appliances. 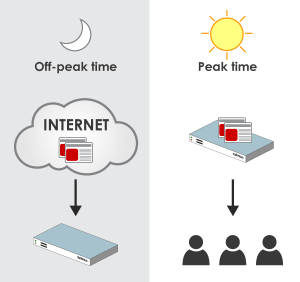 Originally developed by Cisco, WCCP enables a router to separate out web traffic automatically and forward it transparently via CACHEBOX. Other proxy server vendors, including Fortinet, have implemented WCCP support in their products as it simplifies the redirection of web traffic. In addition to making their CACHEBOX deployment easy, WCCP also provides redundancy for the hotels. If there is a problem with the CACHEBOX, objects can be access from the internet without disruption. CACHEBOX has also been integrated with 4IPNET’s Wireless LAN controller which handles access control, reporting and billing for each guests’ internet services. Each hotel has deployed a CACHEBOX050 achieving an average of 25% bandwidth saving with a corresponding increase in the access speeds enjoyed by visitors. To further improve user experience, the hotels utilise CACHEBOX’s pre-caching feature. 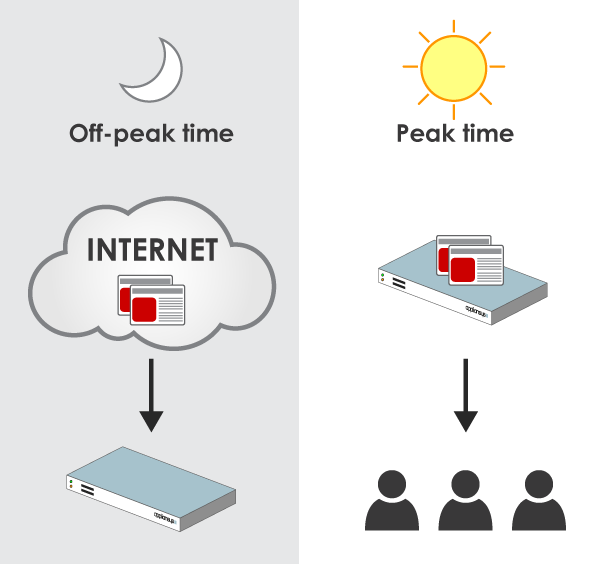 This allows a hotel to specify content which it expects guests will want to access and schedule the appliance to cache it at a time when their bandwidth use is low. This way, hotels can pro-actively gather content from popular international news outlets overnight and serve it to guests in the morning, locally and at high speed. Each hotel is now able to support comfortably up to 150 concurrent devices via 4 ADSL subscriptions. The lower cost of bandwidth improves the profit margins achieved of value added internet services offered to guests. As a result, many hotels have seen a Return on Investment after just 6 months and their customer satisfaction has been greatly improved. “Our hotel clients have improved profits and seen bandwidth savings of over 30%. There’s been a great improvement in access speed for each hotel’s guests,”explained Leerish.